And — you guessed it — Birkenstocks. 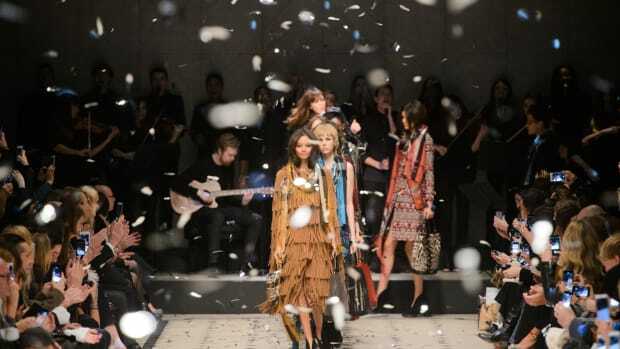 Guests at Burberry&apos;s spring 2015 show were in for a bit of surprise Monday afternoon. The British label covered the runway and ceilings of the large glass-domed show space it has long used to stage its shows in Hyde Park with a rainbow of florals, insects and text which echoed the vivid palette and prints of the collection. With their swathes of reds, pinks, blues and greens, the clothes were similar to the Bloomsbury-inspired collection Burberry showed for fall, though the prints were more saturated and graphic this time, and much less painterly. New was the use of indigo denim on a cropped jacket and a trench coat, and flat, Birkenstock-inspired sandals. Cara Delevingne, a staple of Burberry runways past, instead sat front row next to Kate Moss, who co-starred in Burberry&apos;s recently released campaign for its new fragrance, My Burberry. Erdem, Peter Pilotto, Roksanda and Giles rounded out Monday's top shows.